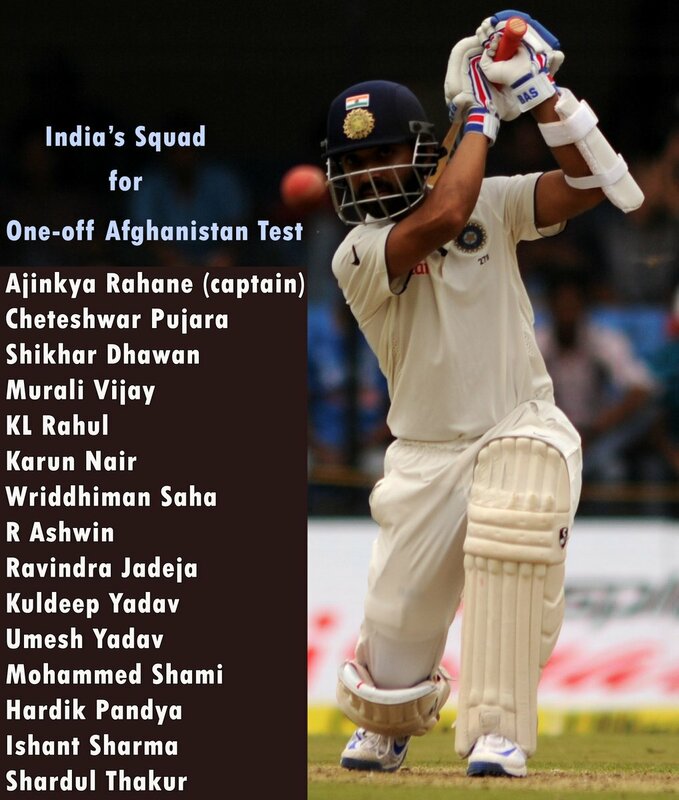 India have announced their Test squad which will take on Afghanistan in their debut in Bangalore. Ajinkya Rahane has been named as the captain of the team. BCCI has annoucned a 15 men squad for the upcoming test agains Afghanisthan on June 14-18 2018. Ajinka will Lead the team as Virat dicided to play county cricket in england and be prepare for up coming 3 series againts england.R Ashwin, Shikhar Dhawan and Cheteshwar Pujara are included in the squad. (Ambati Rayudu makes ODI return). KL Rahul and Murali Vijay one in both will open the innings with Shikar Dhawan. Pujara and Karan Nair make a come back in test squad. Karan who is made a tripule centurien expected to show some form against Afghanisthan. Saha Will do job behind the Stumps. The spin bowling department will be led by Ashwin with Ravindra Jadeja. Kuldeep Yadav is the third spinner in the squad. Hardik Pandya is the all-rounder. The pace quartet of Umesh Yadav, Mohammed Shami, Ishant Sharma and Shardul Thakur complete the squad.